HOUSTON, Texas – March 22, 2016 – Automotive Internet sales expert, Jim Flint announced today that his hit book for auto dealers, Car Dog Millionaire, is now available in an audio format for Apple, Android and Windows OS devices through iTunes and Amazon.com. Car Dog Millionaire is a revolutionary book written for auto dealers and managers to increase their online earning potential. The book is also available in hard cover and paperback, as well as a digital format for tablets and hand-held devices. Flint is the founder and president of Local Search Group and has extensive experience helping auto dealers realize their sales goals through strategic digital marketing. He works with a variety of dealers across the country that represent global marques, including Acura, Aston-Martin, Ford, GMC, Honda, Jeep, Nissan, Porsche, and Toyota, among many others. Flint presents his research and discusses his book with dealers at top industry events including Digital Dealer, CBT Conference & Expo, IS20 Groups, Internet Battle Plan and Innovative Dealer Summit. The printed and digital versions of Car Dog Millionaire can be found on Amazon.com . The new audio book is available through iTunes and Amazon.com. For more information about Jim Flint and Car Dog Millionaire, click this link. Jim Flint is the president and founder of Local Search Group, a digital marketing agency located in Houston, Texas. In 2015, Inc. Magazine recognized Local Search Group as one of the 10 fastest growing ad agencies in the United States. With 4,213 percent revenue growth, Inc. Magazine also named his company the 65th fastest growing company in the entire United States. Prior to founding Local Search Group, Flint developed sales plans, financial plans and marketing strategies for companies including Nike, Toyota and multi-franchise dealer groups. As a 20-year industry veteran, Jim is widely recognized as a thought leader in digital sales operations, marketing and advertising. Jim Flint wrote Car Dog Millionaire using an entertaining quiz show format. 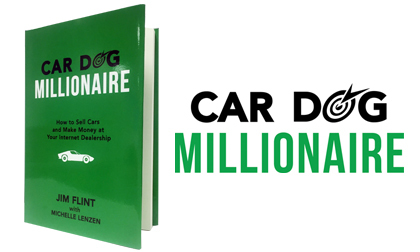 Car Dog Millionaire guides readers through the power of online marketing and how this information can be used to sell more cars and make more money at Internet dealerships. In addition to real-life research, trivia, and valuable advice, Flint offers candid conversations with car dealers as they put these methods to work for themselves and address the most successful strategies for improving their sales.